Cats need exercise to maintain strong muscle mass, high functioning organs, and an ideal body weight that will help them live happily and healthfully into old age. What’s more, a cat that does not exercise enough can become bored, destructive, or just plain irritable. So, what are the best ways to keep your cat in shape? Ever notice that trail of felines behind you when you open a can or pour some fresh kibble? Dr. Karen Becker of Mercola Healthy Pets suggests using this behavior to your advantage. 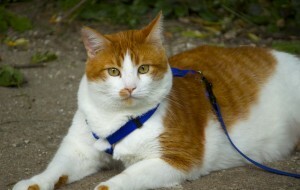 Try leading the furry parade around your house, stopping at intervals to put down small portions of food. “Believe it or not, I can keep my cats moving for 20 minutes this way,” she boasts. You can also make a game out of moving your cat’s dishes between higher and lower surfaces to encourage them to climb and jump. Cats will get the most out of a toy that caters to their hunting instincts. Dr. Rolan Tripp recommends moving toys to mimic prey animals. In a Q&A with WebMD, he says to “take a laser pointer and skitter it across the floor like a bug [or] get a wand toy that looks like a bird and pretend to land and take off.” Remember to let your cat “win” and capture the toy in the end. Dr. Jean Hofve, author of The Complete Guide to Holistic Cat Care: An Illustrated Handbook notes that it’s especially important to follow up playtime with the laser pointer with something the cat can physically catch to avoid fixation and frustration. Even older cats enjoy an invigorating play routine. Get in the habit of playing with your kitty 2-3 times a day, for 10-15 minutes at a time. The best times to play are when you come home from work and right before bedtime to burn off extra energy that could be expressed in unwanted ways. Whether you have a chaotic kitty or a tubby tabby, our pet sitters know how to keep your cat exercising and entertained. Give us a call to find the perfect playmate for your kitty while you’re away. “Milo” by David DeHetre is licensed under CC BY 2.0. How do I prevent shedding?